From Crowded Coop. 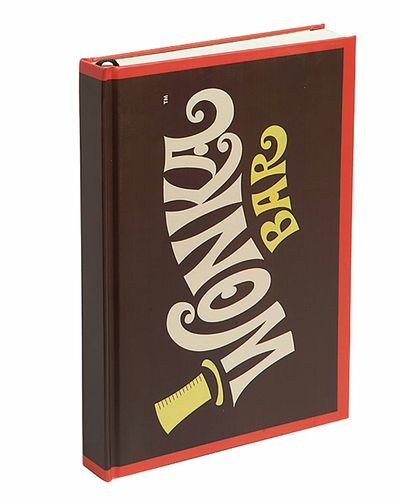 This Wonka Bar Journal is ready to hold your deepest thoughts, even if they're, "Mmm. Candy." Or your dream casting for the potential upcoming prequel. This journal features 116 lined pages with Wonka logos at top and bottom, front endpapers look like chocolate bars and the back endpaper has a folder with your Golden Ticket tucked inside! Journal is 5 3/4" wide x 8 1/4" tall x 3/4" thick and features a place-holder ribbon. Legal Notice: Entire contents trademarked (® or TM) and copyrighted (©) 1986-2019 by Things From Another World, Inc. and respective copyright and trademark holders. All rights reserved. Page rendered at 2019-04-19 01:46:51 in 1.156 seconds.